How The U.S. Helped Fight The Global AIDS Epidemic : Shots - Health News Ten years ago Congress approved a $15 billion plan to combat HIV in developing countries. Since then, the global health initiative has funded HIV treatment for nearly 7 million people and prevented hundreds of thousands of babies from getting infected during childbirth. 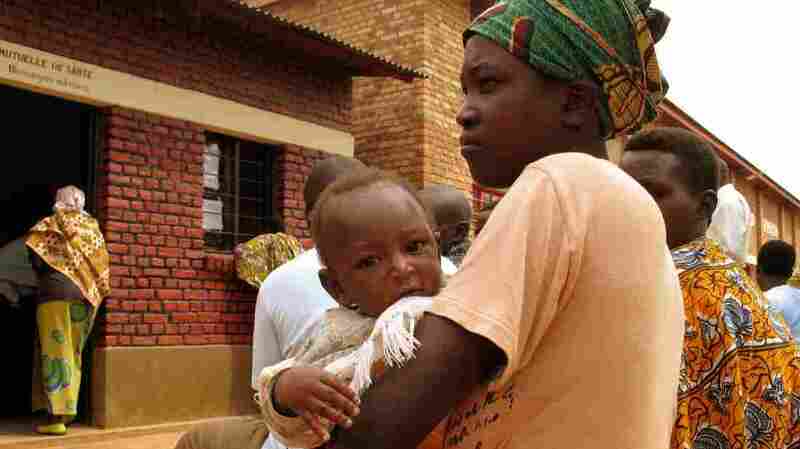 A mother waits with her child at an HIV clinic in Nyagasambu, Rwanda, in February 2008. The clinic was built with a grant from the President's Emergency Plan for AIDS Relief initiative. A decade ago, President George W. Bush announced an unprecedented global health initiative: $15 billion over five years to fight HIV in developing countries. "There are whole countries in Africa where more than one-third of the adult population carries the infection," Bush said in his 2003 State of the Union address. "Yet across that continent, only 50,000 AIDS victims — only 50,000 — are receiving the medicine they need." Congress quickly passed the bill. 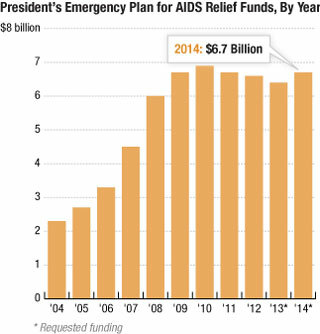 By the end of May 2003, the President's Emergency Plan for AIDS Relief, or PEPFAR, was law. Over the past decade, the U.S. has spent more than $50 billion on PEPFAR, largely to test and treat people for HIV in sub-Saharan Africa. Some health officials have questioned whether PEPFAR has drained money from addressing other problems. But in general, the initiative has been considered a success. Nearly 10 million people around the world now have access to antiviral drugs, and treatment for two-thirds of these people is directly supported by PEPFAR, the U.S. government reported earlier this month. Treatment for HIV-positive mothers funded by PEPFAR prevented 740,000 infants from getting infected with the virus at birth. Back in 2003, South Africa was the epicenter for the global AIDS epidemic. Infection rates were soaring. More than a quarter of pregnant women were HIV positive. And yet the government was still denying that there was a connection between HIV and AIDS. NPR's Melissa Block talked Tuesday with Dr. Francois Venter, a South African HIV specialist, about PEPFAR's impact in South Africa, which has received more money from the initiative than any other country. Venter, who is at the Wits Reproductive Health and HIV Institute, was part of a secret task force within South Africa that was trying to come up with a response to the epidemic. At the time, we were having running battles with what was then the "denialist" government. They were trying to stop us from giving antiretroviral drugs to stop mother-to-child transmission. It was a really tragic time. The minister of health, the president, the whole cabinet was just running interference. And at the time, the PEPFAR money started to roll in ... I can't tell you how bizarre the situation was, where you have the minister of health and the president saying they don't believe HIV exists on the one hand. And then these drugs were flowing freely, almost, in certain places and in certain clinics. When Bush said $15 billion — it's such a large amount of money. Firstly, I don't really know the concept of what that means ... I don't think we anticipated how direct that support was going to be. It came with lots of constraints, but they kind of turned around to us and said, "Put as many people on antiretroviral therapies as you possibly can. Test as many people for HIV as you possibly can." It was a very different world suddenly. And you have to understand that nobody had done anything on this scale before. So there were a lot of mistakes to be made. I have criticisms of the approach. I think there wasn't nearly enough focus on how to disburse the funding. We were able to hire staff, and we were able to buy drugs. We could fix little aspects of the government. I remember my own clinic: We first were able to renovate the place ... We were able to put in additional pharmacy staff, additional doctors, additional nurses. I think PEPFAR, really, has saved a huge number of people's lives. This has been one of the most effective public health inventions outside of clean running water, decent nutrition and vaccine programs. This has made an unbelievable difference.